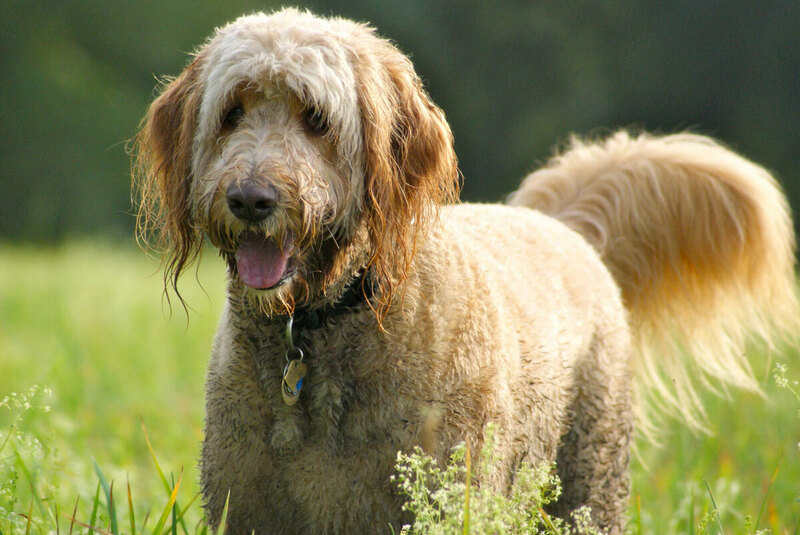 Goldendoodles are a fantastic choice for most owners and, in fact, there are few drawbacks to this breed. They are super smart, trainable, sweet and gentle fluffballs. They range in size from small to large and are, therefore, able to find a place in any home. Their characteristically wavy coats require little grooming and are mostly hypoallergenic; they come in a large variety of colors. Doodles are loving playmates for kids, social with other pets, and even friendly towards strangers. Daily outdoor exercise is a must for this breed and they may develop destructive behaviors if left alone all day with no human interaction. This healthy breed often lives up to 15 years with no major issues! This hybrid is primarily a companion dog, however, their trainable, gentle and lovable natures allow them to perform therapy dog duties. They will be quite content to live with the average owner or family, meaning that an intensely active lifestyle is not necessary. Petite and Miniature varieties will do fine in an small dwelling, while Medium to Standard sized may not be comfortable in a small apartment. As long as you give these guys enough exercise a fenced yard is not necessary, although they will certainly make use of it if you do! Excellent choice for households with children, other pets, and frequent visitors. Those will allergies should do fine with this breed. Energetic and willing to participate in your exercise. Some varieties may be too large for a small apartment or condo. They may develop destructive behaviors if left alone for long periods of time. Need daily, outdoor exercise (preferably an hour). 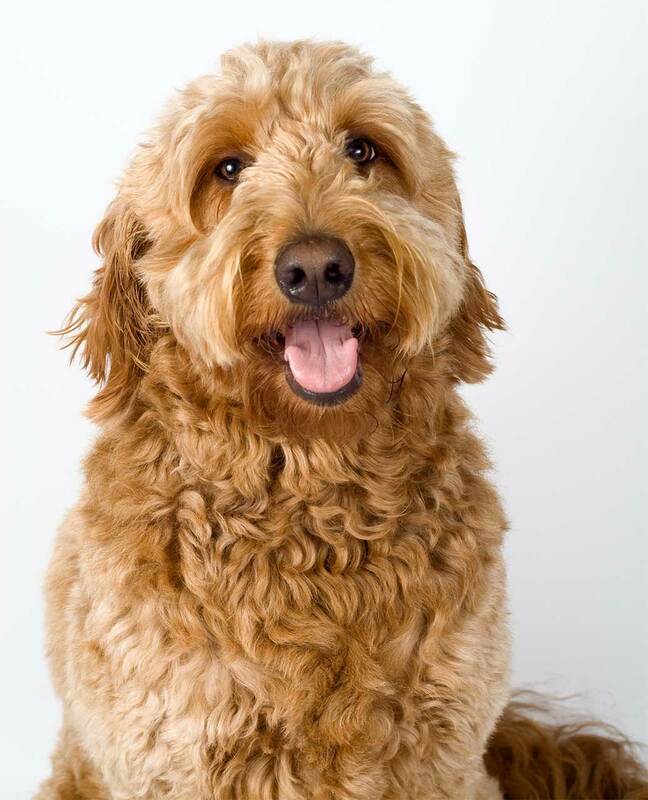 Goldendoodles, as hybrid dogs, will inherit characteristics from both parents but not always equally. We recommend prospective owners read up on the traits of both Golden Retrievers and Poodles before adopting one of these guys. The following information for this breed can be supplemented by visiting our parent breed pages. Both parent breeds are near the top of the list of most trainable breeds in the world. Your Goldendoodle will also be very trainable. The intent was to preserve the Poodle intelligence and the Retriever's happiness and sweetness. 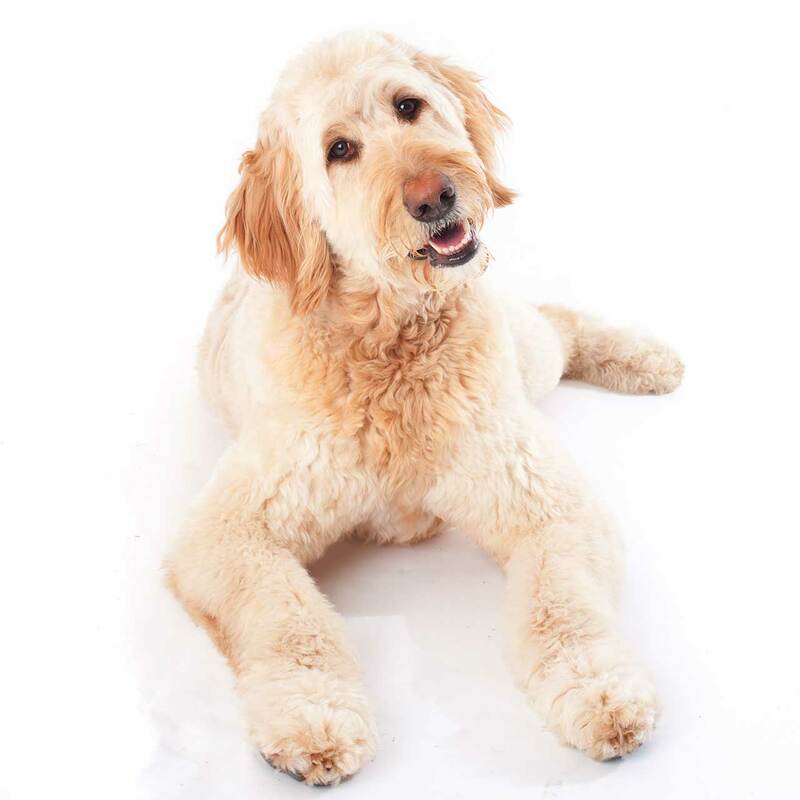 If trained and socialized early, there won't be anywhere your Doodle can't go, in fact, they are often trained as therapy and companion dogs for the disabled. They respond well to reward based training and harsh tones will be counter productive. This may be one of the ultimate family pets. They are lovable, playful, gentle and devoted. Their happy-go-lucky attitude makes them excellent playmates for kids. Members of this breed tolerate other pets in the household very well and will be friendly to acquaintances and strangers alike. This breed is truly a people loving breed that shouldn't be left alone for more than a reasonable amount of time (while you're at work). Exercise for both body and mind is a must for this breed. Obedience training is something he/she will excel and and is a great way to bond with your pet. Goldendoodles like toys and will appreciate a game of fetch. Playtime in a fenced yard as well as daily leashed walks are recommended; they will never say no to a trip to the dog park. Long walks, hikes, and even swims are just a few of the most common activities your Dood will participate in. Goldendoodles came onto the "designer" hybrid dog scene of the U.S. and Australia in the early to mid 1990's. The name 'Goldendoodle' is thought to have been coined in 1992 by the Neelands family. Since then, they have become an extremely popular cross breed, especially with families, due to their lovable, playful, and highly trainable natures. The maintenance of this high popularity can also be attributed to the fairly hypoallergenic quality of the coat that makes them desirable for those with mild allergies to dogs. The Poodle genes ensure this hybrid sheds much less than the Golden Retriever but still retains the happy-go-lucky personality. The first litter of Mini Goldendoodles was born in 2002 and this variety, which is better for apartment dwellers, is also equally popular. Presently, the breed has expanded to include 4 sizes: petite, mini, medium and standard. 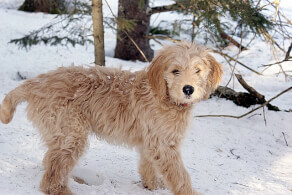 The appearance of a Goldendoodle will vary from one puppy to the next but, in general, they will be fluffy with a wavy coat anywhere from 4-8 inches long. The coat may change in appearance and there are actually a few possibilities. While most will have a fluffy, wavy coat, others will have a straight and flat one like the Golden. Still, others may have a curly version more reminiscent of the Poodle. They also range in size from small to large, however, most members of this breed are on the medium-large end. Their soft coats have endless color possibilities and may be solid, bi-colored, multicolored or "phantom". These dogs have sweet yet keen eyes and their tails are never docked. The Goldendoodle, as a hybrid, will display greater variation in coat colors and combinations. Goldendoodle puppies, even if from the same litter, will have a seemingly endless coat possibilities. They may be solid or multicolored and are typically various shades of the following: cream, apricot, black, white, red, chocolate, silver, parti (white base with large splotches of another color), and phantom (bi-colored with all markings of a Doberman). Often, these same colors will be referred to by a different descriptive name such as "Champagne" or "Golden", but are generally referring to a more basic color term mentioned above. The size of a fully grown Goldendoodle will vary quite a bit among individuals. Hybrid dogs often fall outside the weight and height ranges of their purebred parents. This is particularly true for this breed as there are four acceptable sizes: petite, mini, medium and standard. Size is an important consideration for those that live in small apartments and condominiums. Petite is the smallest variety of Goldendoodle. They typically weigh less than 25 pounds and stand up to 14 inches at the shoulders. Mini is the next size larger and will reach 14-17 inches at the shoulder. This type weighs between 26-35 pounds. Medium, the second largest size, includes those above 17 inches, and up to 21 inches, at the shoulder. They will weigh somewhere between 35-50 pounds. Standard sized Goldendoodles will start at 51 pounds and 21 inches shoulder height. Hybrid dogs are typically much healthier than their purebred parents, especially first generation (F1) crosses. 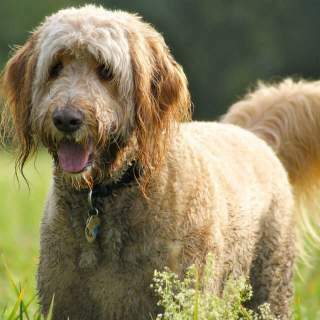 F1 Goldendoodles are bred by mating a purebred Golden Retriever with a purebred Poodle, whereas an F2 would be obtained by breeding two F1 Goldendoodles. Mild allergy sufferers can usually handle these generations, however, more severe cases typically fare better with F1B and F2B puppies. These are back crosses where the F1 or F2 is bred with a purebred Poodle. There are a few different possibilities in regards to your hybrid's coat texture. Some members of this breed will have a straight, flat coat like the retriever while others may have the tightly curled coat of the poodle. Most will have somewhere in between and display a fluffy, wavy coat. The texture is not necessarily an indicator of hypoallergenic quality. This breed actually has four acceptable size variations. They range from Petite, the smallest, weighing less than 25 pounds to the Standard size that starts at 51 pounds. There are 2 sizes in between, the Miniature and the Medium. Minis are the very popular size up from the Petite and Medium is a step down from the Standard Goldendoodle. Teacup sized individuals are not likely, considering one of the parents is a large dog and breeding Goldendooldes down to that size would have harmful effects of their health. The Goldendoodle temperament is most often described as gentle, happy, playful and energetic. These guys are said to possess the Poodle intelligence and the Retriever's lovable personality. They truly love being around people and are social and non aggressive towards other dogs, cats, kids and even strangers! Those considering a member of this breed should have plenty of time to spend with them every day; all though they don't need your constant attention, they may develop behavior problems in left alone for long periods of time. Obedience and trainability are notable characteristics of the Goldendoodle. Both parent breeds are among the top most trainable in the world. Treats and praise work well with them, and harsh tones and anger are counter productive. Good-natured, easy going temperaments make for the best family companions. These dogs are devoted and gentle playmates for children. While kids of almost any age can be trusted with your Goldendoodle, babies should never be left alone with dogs (in this case due to their sheer size). It is best to teach children how to respectfully handle and play with pets. These sociable dogs are typically good with other pets, even cats! They are gentle and non aggressive. 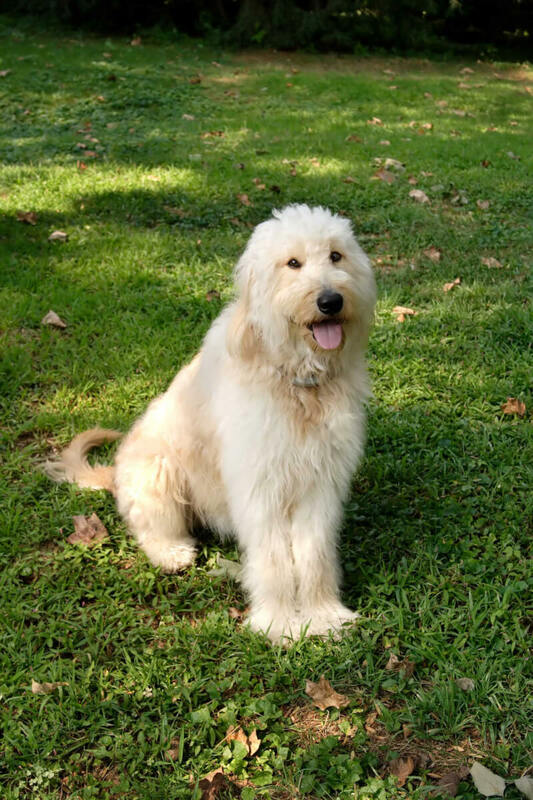 The best results are obtained from training and socializing your Goldendoodle as a puppy; these guys are highly trainable and problematic behaviors can be easily curbed. 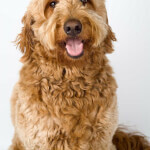 Below are pictures and images of the Goldendoodle dog breed. Members of this breed are very gentle and friendly. They are excellent choices for households with frequent visitors. They are able to spend reasonable amounts of time alone, such as while the owner is at work, but as a people loving breed they need your companionship daily. Although they enjoy a large fenced yard to play in, Goldendoodles are perfectly suited to indoor living. Mini Goldendoodles will be fine in an apartment or condo while Standards will fare well in an average size home. These dogs are not quite as hypoallergenic as the Poodle. Some will produce less dander than others (or less of the protein that causes the allergy). Overall, this is considered a good choice for allergy sufferers and many breeds will allow you to do a "test visit" and "t-shirt test" to see how the puppy is tolerated. Golden Retriever and Poodle mixes result in puppies that should be healthier than the parent breeds, especially first generation crosses. Choosing a reputable breeder that offers health certifications, combined with routine trips to your veterinarian, can help prevent some issues. It is recommended you read up on all possible health issues of both parent breeds before adopting one of these dogs. Typically, this breed will live around 15 years with few problems. Goldendoodles, themselves, are prone to hip dyslplasia and eye diseases. Addison's Disease, as well as Subvalvular Aortic Stenosis (a heart defect), are less common conditions.